This truly is my FAVORITE time of the year. I get very nostalgic during Christmas. This season has always been a special time in my family. My dad always made it very fun and meaningful! I also got engaged on Christmas one year AND my son was born 2 weeks to the day before Christmas. So I get very sentimental during this time. NOT to mention the true reason for Christmas! Needless to say I heart Christmas!!!! One of the reasons that I think that Christmas is so special is that people really get into giving and our fabulous business owners in Huntsville have done just that!!! We have truly been blessed this year to feature such wonderful local boutiques with such wonderful, generous owners!!! We have been so honored to go into these boutiques, get to know them and their shops and then bring them into your homes!!! So without further adieu, I give to you THE ULTIMATE CHRISTMAS GIVEAWAY!!! We have not 1, not 2 but 3 UNBELIEVABLE gifts to give 3 VERY lucky winners!!! Our first fabulous bundle is…. A Scrumptious $100 gift certificate to Lyn’s Goodness Gracious, a $35 gift certificate to Cotton Cottage, and a $30 gift certificate to Silhouette Boutique!!! Our final fabulous bundle is …..
Now if those don’t get you excited I am not sure what will!! Thank you to all of our Mom About Town boutiques for your generosity!! We have so enjoyed you all this year and REALLY look forward to what 2012 has in store!!!! To our readers: as you’re putting the final touches on your Christmas shopping, please keep these local shops in mind. They are the heartbeat of our local economy. What better gift to give than something beautiful and unique from right here in Huntsville?! The 3 winners will be drawn at random and the packages will be drawn at random too! 1. Leave a comment below letting us know what caught your eye in this blog post. 2. Like Erin Cobb Photography on Facebook (or tell us you already do) and leave a comment letting us know. 3. Follow Erin Cobb on Twitter (or tell us you already do) on Twitter and leave a comment letting us know. The drawing will be Sunday December 25 at 8pm and announce on December 26th!!! Good Luck and Merry Christmas to you all!!! Robin Monroe – Thank you, Erin for making our Christmas list so much easier! You are the best! Robin Monroe – I have already liked Erin Cobb FB…. thank you so much! Randal Saraceni – I like Erin on FB! Randal Saraceni – I follow Erin on Twitter! 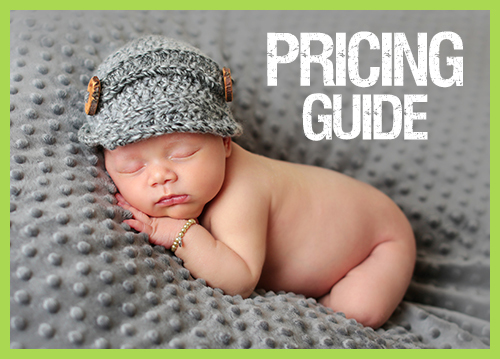 Kris Thacker – I love your photography and have just discovered all the helpful things on your blog! Hope to have you photograph my family soon!! Randal Saraceni – I LOVE that all of the stores are local! My family was raised on small business and I love to support them. Stacy C. – WOW! Such awesome giveaways! You gals are awesome! All of these bundles are amazing but the Shoefly certificate really caught my eye Hope you all have a Merry Christmas! Karen Rass – I love Erin Cobb and her family!!! Stacy C. – I “Like” Erin on Facebook! Christina Hearne – I am following Erin Cobb on Twitter! Christina Hearne – What awesome gift packages you are giving away! Christina Hearne – I alrady like Erin on Facebook! Tori Gilliam – I love shopping small business and supporting our community. Thank you for introducing me to some wonderful shops right here in our neighborhood! Tori Gilliam – I follow Erin on FB. Kay Siniard – Love your blog and your support of local busineses! Great giveaways! I already like Erin Cobb Photography on FB! Merry Christmas! Ashley – Too many good things to talk about! Love the Kid Venture card for those cold winter days, but I love the idea of a little retail therapy at the ladies’ stores!!! Thank you for all you do! Ashley – And I “like” Erin Cobb on FB, too! Amy – I heart Erin Cobb on FB!! AmyJ – I like Erin Cobb on FB!!!! 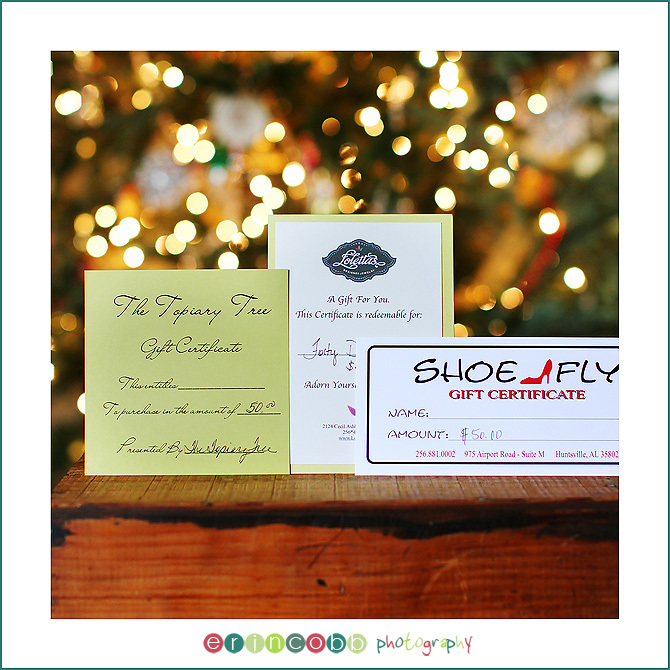 Laura – Lynn’s Gracious Goodness caught my eye, so did the Shoefly gift certificate. Thanks for the opportunity! Laura – I already like Erin Cobb on Facebook! AmyJ – I could really go for some Lyn’s right now! Amazing giveaways!!! Laura – I also follow Erin Cobb on Twitter! Jen – I like Erin on FB! Jen – Kid Venture…I think my two year old would love it! Ashley Dawson – The pretty lights in the background caught my eye, and the FABULOUS gift certificates and the wonderful stores that they are for! Merry Christmas! Sandy – What great Christmas gifts! Thank you all for being a great part of this Huntsville community. I like Erin on Facebook too! Rebecca – You’ve got some of my favorite stores! Thanks for supporting local businesses! Rebecca – I’m a FB fan. Rebecca – And now I’m following on Twitter too! Leslie – Envy always catches my eye!!!!!! Merry Christmas! Erin K. Smith – Yummy…the Lyn’s bundle sounds fabulous!! Merry Christmas!! Erin K. Smith – I like Erin Cobb…I like her on fb too!! Celeste – I like it all! Mendy – I’d love to win any of these…thanks for the giveaway! Kelly Hudson – I already love Erin Cobb on FB! What fabulous giveaways ! Deirdre McFerran – already like Erin Cobb photography on fb! and love your support for all the local stores!! I like all of these!! 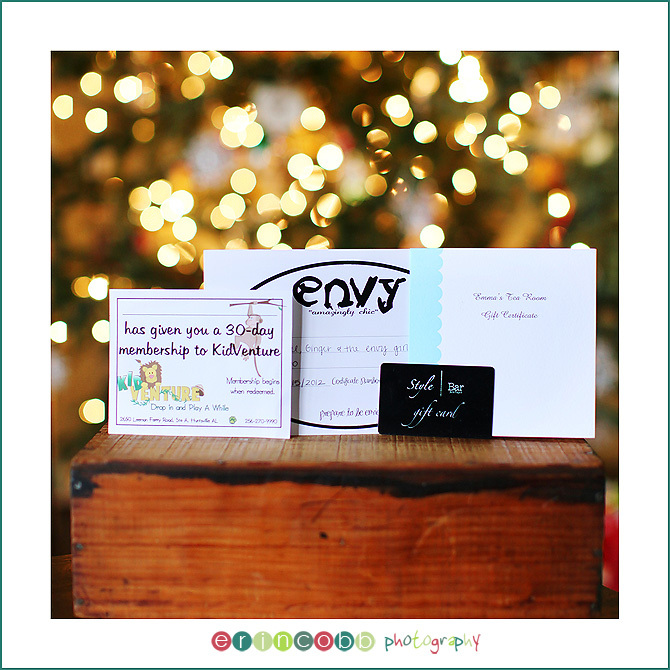 Beth – What great gift packages!! Would love package #3!! Amanda – I already love shopping at a lot of those included in these giveaways!!! Amanda – I like Erin on FB! Caitlin Eason – My mother and I follow your blog! We would love to win!! All the stores are fabulous! Thank You!!! Abigail – Yummy! I love Lyn’s Gracious Goodness. I used to eat there all the time when I worked at the hospital. Abigail – I like Erin Cobb on FB! Abigail – I follow Erin Cobb on twitter. Katie B – Great Giveaways! Melodie Schroder – With 4 little ones, kidventure is a great outing for our family! Laura Hodge – I just went to the Topiary Tree to order invitations for my daughter’s birthday party. Their gift certificate sure would come in handy! Amy Layne – I like Erin Cobb on FB! Amy Layne – All the posts interest me :). Laurie H. – I want any of them!!! Laurie H. – I like Erin on FB!! Anna W. – There was a lot eye-catching about this post!! I would love to have any of the three bundles, but my mouth is watering thinking about the fabulous pimiento cheese sandwich from Lyn’s Gracious Goodness! Anna W. – I already like Erin on Facebook! Anna W. – I follow Erin on Twitter! Jessica M – Love Mondays and reading about what is new! Christi – I like Erin Cobb Photography on facebook! Liz – I LOVE Lyn’s and the Topiary Tree! Whitney Brink – Would LOVE to win one of those great giveaways… Pick me! Arlana – Free stuff caught my eye. Trying to sell a home, renovating another…need free stuff now!!! Erin – KidVenture! I have two kids that already have cabin fever. Thanks for an amazing giveaway! Erin – I like Erin Cobb Photography on Facebook! Amber – I’m an Erin Cobb fan on FB and on real life Love all the Mom About the Town write ups and offers! Jessica Pinegar – I Love shoefly!! Judy Hodges – I love Shoe Fly and Envy!!! They have THE best clothes! Megan Smith – I love learning about local businesses on your blog! The great prizes definitely caught my eye. Megan Smith – I like Erin Cobb on FB! stephanie – Seriously, these giveaways are amazing with amazing stores! stephanie – I like erin cobb on FB! Amy – Lyn’s!!! Love it!!! Look at this collection of places – y’all just have the best taste!!! Ginger Bryant – WOW!! This is SO exciting! How generous of everyone!! Ginger Bryant – I like Erin on FB too!! Jessica – LOVE this!! these are all fabulous places to shop! what great packages! I already “like” Erin Cobb Photography on facebook! !…love your work! it is amazing how great things like this are for local businesses! what better way to get into the christmas spirit! Sonja – I “LIKE” Erin on Facebook! Sonja – All of these are AWESOME giveaways!! Would love to win one!! Robin – I love all the local stores, especially Lyn’s! Krista P – We love reading Erin’s Blog and like her on FB! Rachel Clark – I like Erin Cobb on facebook. Rachel Clark – All three bundles are amazing. Thanks for supporting and sharing local businesses with us! Merry Christmas to all! AmyBlam – WOW-so hard to choose! But I think if I had to pick one-it would be the last. I can ALWAYS find something that sparkles at Loletta’s and sparkly is my favorite color! AmyBlam – I like on Facebook! AmyBlam – And I follow on twitter! Heather – It all sounds fantastic but I love the Topiary Tree, Shoe Fl y and Lyn’s Gracious Goodness. Heather – I like Erin Cobb on fb. Anna Claire – All the lovely shops caught my eye…what an amazing giveaway! Anna Claire – I follow Erin on Facebook! Anna Claire – I also follow on Twitter! Kristina – I would love any of these!! All are fabulous places to shop! Courtney Edmonson – I like Erin Cobb Photography on Facebook. Erin is so talented. Allison Akins – I always enjoy your site and seeing the new pictures! Merry Christmas! Allison Akins – I already follow you on twitter! Elise – Thanks so much for doing this! Been a “fan” oh Facebook for sometime now! Brandi – I am a Facebook fan! Brandi – I follow you on Twitter! Brandi – I love Lyn’s! Thanks for a great giveaway! Kristi Wells – Such great stuff! There is somewhere in each bundle that I love, and somewhere that I want to try! Kristi Wells – I follow Erin on FB! Nilima – All these bundles are great. The one that caught my eye was the first bundle. Kelly – Any of these would be awesome to win but I do love Shoefly! Kelly – I follow Erin on FB! Meredith – Awesome gifts! Awesome support of small local businesses! Kudos to you, Erin! I follow on FB too! Lacy – I like ECP on FB. Lacy – I follow Erin and Heather on Twitter! Lacy – It all catches my eye!!!! Rachel – These are all so amazing! 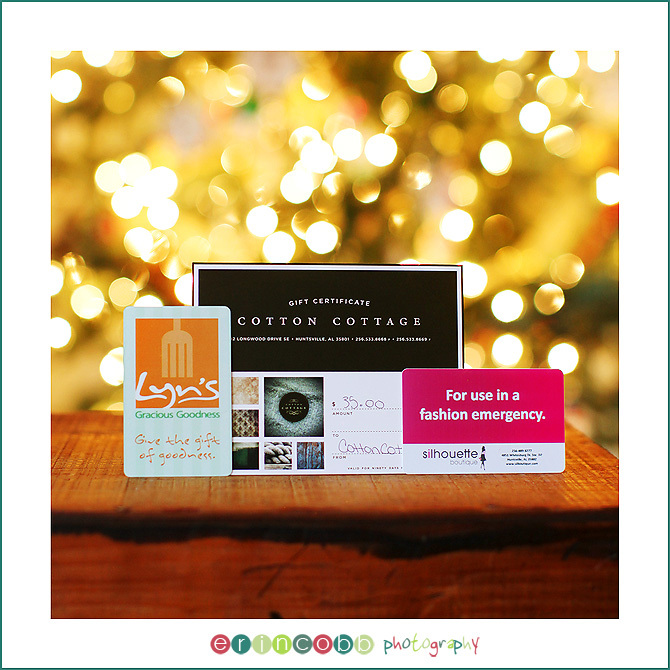 I especially like the one with Silhouette, Cotton Cottage, and Lyn’s! Rachel – I like Erin Cobb Photography on Facebook! Rachel – I follow Erin on Twitter! Kera – Can’t wait to see who wins! Awesome giveaway! 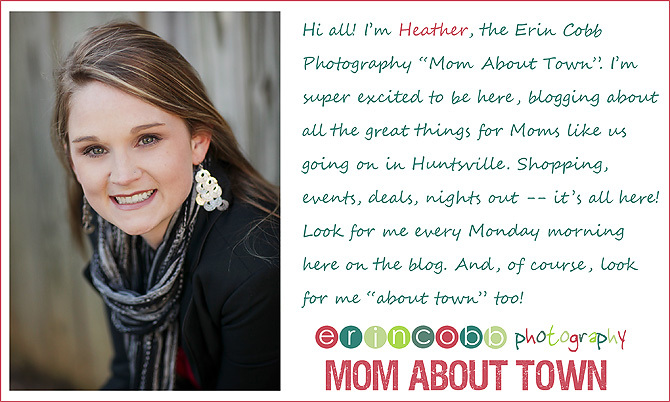 Heather – I follow Erin (and have been) on this blog and her pigbear blog for years!! What a generous give a way! The 1st or 3rd package would be awesome to receive!! Heather – I follow Erin on Twitter! Heather – AND on facebook!! Merry Christmas!!! !